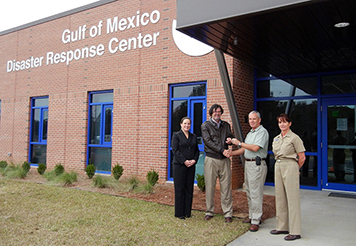 NOAA moves into the Disaster Response Center in December 2011. NOAA responds before, during, and after disasters, from forecasting the paths of hurricanes to restoring the environment after an oil spill. Until recently, however, there was no central hub in the Gulf of Mexico to assist in regional coordination around these disasters. NOAA's Gulf of Mexico Disaster Response Center establishes an unprecedented regional presence and expands federal capacity to plan for and respond to all hazards. Over the past decade, the Gulf region has faced both natural and human-caused disasters, including hurricanes, oil spills, tornadoes, droughts, harmful algal blooms, and wildfire. While we often cannot prevent these severe events, we can reduce their impacts by helping to prepare federal, state, and local decision makers for a variety of hazards and threats. A regional coordination center to enhance all hazards preparedness, response, and recovery. Training courses and technology demonstrations, offered regularly and upon request. Meeting space for emergency preparedness trainings, workshops, and drills. A disaster-ready facility available as an emergency operations center during crisis situations. The 15,200-square-foot facility is centrally located in Mobile, Ala., and is only minutes from Mobile Regional Airport. The building is designed to be operational during severe weather events and is Category 5 hurricane resistant with an interior F5 tornado shelter. The facility not only includes office space, a training room, and conference rooms but also a large multifunction space which can be used for trainings, meetings, emergency response operations, and drills. For more information about NOAA's Gulf of Mexico Disaster Response Center, visit the National Ocean Service website or subscribe to our monthly newsletter.